Ten days ago in New York, I launched the Kickstarter campaign to raise funds for self-publishing my second book, Wines of the French Alps. 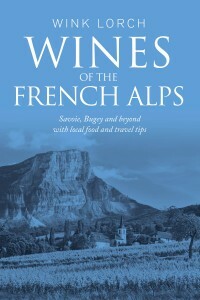 The book’s focus will be on wines from Savoie, Bugey and other French Alpine regions. Click on the Kickstarter video below for more. I had gone to New York, as well as Chicago, to present seminars at the Jura Wines export trade tastings and while there also sold a good number of Jura Wine books. Be warned, there are very few copies of the book left from the 2015 revised printing, however you can still buy the book from this site, and you can also get one as a reward on the new Kickstarter campaign as a 2-book package. 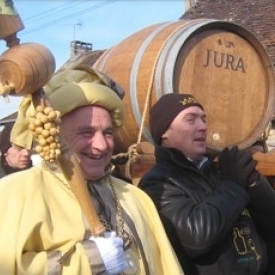 New York was ideal for the launch of the Kickstarter campaign because wine pros and wine lovers in the city have been so supportive of Jura Wine, both leading up to the 2013 Kickstarter and after publication in 2014. And, there is a growing awareness in the city among somms, importers and indie wine stores of the potential of Savoie, Bugey and Isère wines, with several already distributed there. We celebrated the launch with a Savoie wine dinner for 24 people at Craft Restaurant, organised together with Flatiron Wines, and then the following day at an in-store tasting with Chambers Street Wines. The wines at both events included wines from Bugey and Isère as well as, of course, Savoie. Yesterday Chambers Street were good enough to share the story of my Kickstarer project on its home page and send out a mailshot about it – I am really grateful for the support of the Downtown New York wine people, who simply ‘get’ and will buy unusual wines! Almost ten days on from the launch, the campaign has raised nearly half of the £12,000 target amount from more than 160 backers, all so far from pledges for the books, rather than from the choice of higher-value rewards – excellent news as it shows support for this new book. 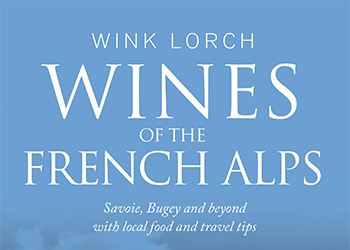 I have allocated up to 300 Wines of the French Alps books at a special reward price of just £20 (plus shipping for outside UK/France). There is also an excellent deal for five books and a special price for a package with the Jura Wine book. Note too that with the current exchange rate between the UK pound and the euro or US dollar, it’s a win for all of you outside the UK, right now. Wink with Marc and Laetitia Allemand, producers in Hautes-Alpes. Photo by Brett Jones. 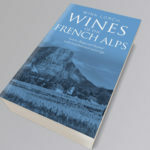 For those of you who love the Jura Wine book, rest assured that the Wines of the French Alps book, although covering a much larger region, will go into the same depth, exploring the grape varieties, terroir and most importantly the wine producers – big and small, organic and conventional. 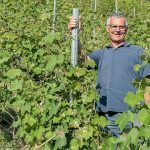 It’s the stories of the people who will make up an important part of the book and there are increasing numbers of exciting producers in Savoie, Bugey and beyond. 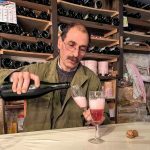 They are making mountain wines that have a growing appeal in the valleys; importers in the UK are snapping up the best producers, mainly for sale to restaurants and wine bars. I’m lucky to be working again with Mick Rock and Brett Jones as chief photographers, with Quentin Sadler as cartographer and Jane Dixon-Smith as designer. I have a new, but very experienced wine editor, Maggie Ramsay, who I’ve worked with before on Oz Clarke’s wine books. 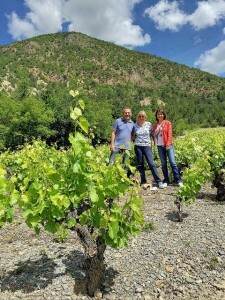 Higher value rewards – French Alps Wine Event or Tour? If you have ever wanted to visit the elusive vineyards of Savoie or Bugey, there is a choice of higher value rewards on the Kickstarter project including an offer to help you plan your own trip, an accompanied day trip in Savoie, or the big one – a 3-4 day visit in Savoie and Bugey. And, if you would like me to come to entertain/educate your friends, family or colleagues about the wines of the French Alps, then kick in for a reward for me to host an event for you, with wines included of course (although I can’t spell that out on Kickstarter, due to their rules). My self-published Jura Wine book won the André Simon Food & Drink Book Awards Best Drinks Book in 2014, and has now been sold to people in over 40 countries. I hope to achieve the same success for my next book, due for publication in November 2017. For that I need your help. I need the assurance of funds and the commitment of people wanting this book to motivate me to get this book completed on time. Can you help please? The project went live on Kickstarter at 4pm New York time last Thursday 6th April and will end on Monday 8th May at 11pm London time. 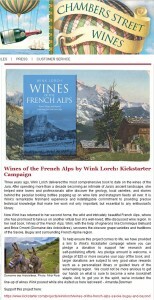 The Kickstarter project is online at https://www.kickstarter.com/projects/winklorch/wines-of-the-french-alps-savoie-bugey-and-beyond. An early-bird reward, limited to the first 300 pledges of £20 (+ shipping contribution for addresses outside the UK/France), provides a signed book for delivery in November. A range of other awards is offered.